Bloomberg attributed its fall to 11th place from ninth last year largely to an eight-spot slump in the rating of its tertiary education, which includes an assessment of the share of new science and engineering graduates in the labour force. The US is now ranked 43 out of 50 nations for “tertiary efficiency”. Singapore and Iran take the top two spots. Despite these setbacks, the Bloomberg Innovation Index still ranks the US as number 1 when it comes to its density of tech companies. The US is also second only to South Korea for patent activity. 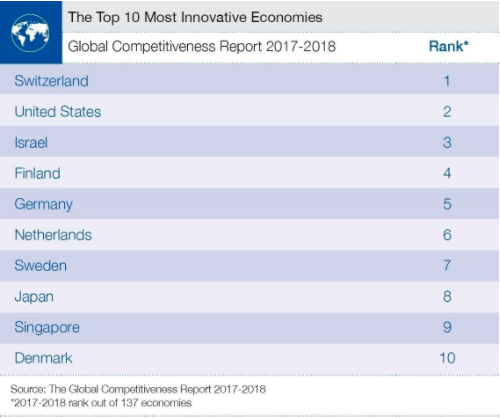 Taking third spot in the Global Competitiveness Report’s innovation league table, Israel is ranked 10th best country in the world for innovation overall by Bloomberg. However, its index also ranks Israel as number 1 for two categories of innovation: R&D intensity and concentration of researchers. Israel’s talent for research and development is illustrated by some of the major tech innovations to come out of the country. These include the USB flash drive, the first Intel PC processor and Google’s Suggest function, to name just three. 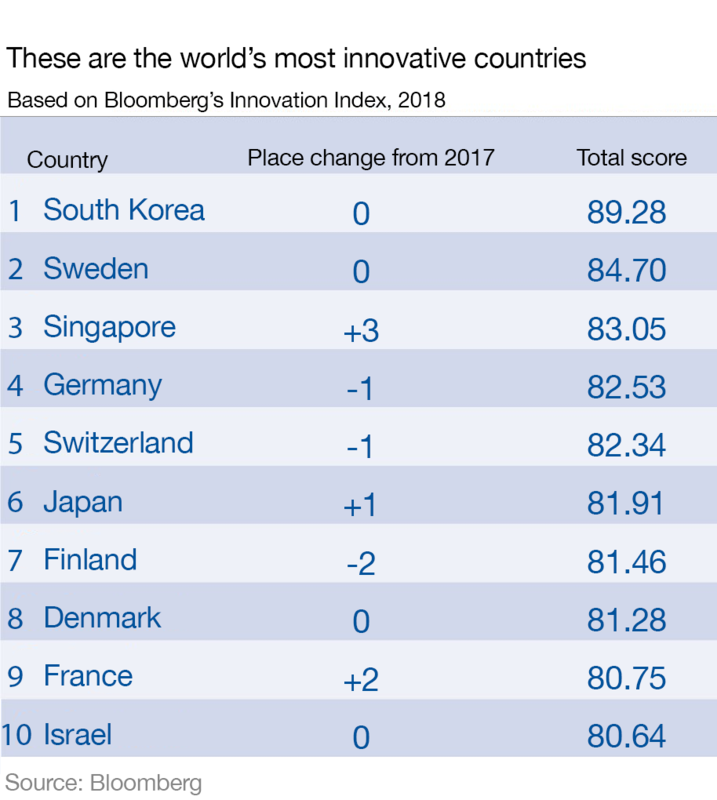 When it comes to being a world leader at innovation, it may simply be the case that you get out what you put in: according to OECD figures, Israel spends more money on research and development as a proportion of its economy than any other country – 4.3% of GDP against second-placed Korea’s 4.2%. We need to begin a serious debate about whether artificially evolved humans are our future, and if we should put an end to these experiments before it is too late. In 2016, Craig Venter and his team at Synthetic Genomics announced that they had created a lifeform called JCVI-syn3.0, whose genome consisted of only 473 genes. This stripped-down organism was a significant breakthrough in the development of artificial life as it enabled us to understand more fully what individual genes do. (In the case of JCVI-syn3.0, most of them were used to create RNA and proteins, preserve genetic fidelity during reproduction and create the cell membrane. Venter’s achievement followed an earlier breakthrough in 2014, when Floyd Romesberg at Romesberg Lab in California succeeded in creating xeno nucleic acid (XNA), a synthetic alternative to DNA, using amino acids not found among the naturally occurring four nucleotides: adenine, cytosine, guanine and thymine. And, most recently we have seen huge advances in the use of CRISPR, a gene-editing tool that allows substitution or injection of DNA sequences at chosen locations in a genome. In the near future we can reasonably anticipate that a large number of unnatural single-cell life forms will be created using artificially edited genomes to correct for genetic defects or to add new features to an organism’s phenotype. It is already possible to design bacterial forms, for example, that can metabolise pollutants or produce particular substances. We can also anticipate that new life forms may be created that have never existed in nature through the use of conventional and perhaps artificially arranged codons (nucleotide sequences that manage protein synthesis). These are likely to make use of the conventional machinery of mitotic cell reproduction and of conventional ribosomes, creating proteins through RNA or XNA interpretation. And there will be increasing pressures to continue this research. We may need to accelerate the evolution of terrestrial life forms, for example, including homo sapiens, so that they carry traits and capabilities needed for life in space or even on our own changing planet. All of this will bring up serious issues as to how we see ourselves – and behave – as a species. While the creation of multicellular organisms that are capable of sexual reproduction is still a long way off, in 2019 we will need to begin a serious debate about whether artificially evolved humans are our future, and if we should put an end to these experiments before it is too late. It’s about artificial intelligence, data, and things like quantum computing and nanotechnology. Australian National University’s 3A Institute is creating a new discipline to manage this revolution and its impact on humanity. Diagrams explaining the fourth industrial revolution, like this one by Christoph Roser, are OK as far as they go. Apart from the term “cyber physical systems”. Ugh. What they mean is that physical systems are becoming digital. Think of the Internet of Things (IoT) supercharged by artificial intelligence (AI). “Now for those of us who’ve come out of the social sciences and humanities, this is an excellent chart because of the work it does in tidying up history,” Bell said in her lecture at the Trinity Long Room Hub at Trinity College Dublin in July. Another problem with this simplistic view is the way the Industry 4.0 folks attach dates to this chart. Steam power and mechanisation in 1760-1820 or so. Mass production from maybe 1870, but the most famous chapter being Henry Ford’s work in 1913. Then computers and automation started being used to manage manufacturing from 1950. “That time scheme works really well if you’re in the West. It doesn’t hold if you’re in China or India or Latin America or Africa, where most of those things happened in the 20th century, many of them since 1945,” Bell said. Take the steam engines of the first industrial revolution. They were built by blacksmiths and ironmongers, who knew what they needed to build the engines. But they didn’t know how to shape the industries the engines could power, or how to house them, or about the safety systems they’d need. These and other problems generated the new applied science of engineering. The first school of engineering, the École Polytechnique, was established in Paris in 1794. “So, engineering, business, and computer science: Three completely different applied sciences, emerging from three completely different technical regimes, with different impulses,” Bell said. With this in mind, Bell said that the fourth industrial revolution needs its own applied science, so that’s exactly what the 3A Institute is going to build — as the website puts it, “a new applied science around the management of artificial intelligence, data, and technology and of their impact on humanity”. Nine months into this grand project, it’s identified five sets of questions that this new science needs to answer. If autonomous systems are operating without prewritten rules, how do we stop them turning evil, as so many fictional robots do? How do different autonomous systems interact? How do we regulate those interactions? How do you secure those systems and make them safe? How do the rules change when the systems cross national boundaries? Second is Agency, which is really about the limits to an object’s autonomy. With an autonomous vehicle, for example, does it have to stop at the border? If so, which border? Determined by whom? Under what circumstances? “Does your car then have to be updated because of Brexit, and if so how would you do that?” Bell asked. If autonomous vehicles are following rules, how are those rules litigated? Do the rules sit on the object, or somewhere else? If there’s some network rule that gets vehicles off the road to let emergency vehicles through, who decides that and how? If you have multiple objects with different rule sets, how do they engage each other? “The industrial revolution thus far has proceeded on the notion that the appropriate metric was an increase in productivity or efficiency. So machines did what humans couldn’t, faster, without lunch breaks, relentlessly,” Bell said. Some AI techniques, including deep learning, are energy intensive. Around 10 percent of the world’s energy already goes into running server farms. Maybe an energy efficiency metric would mean that some tasks would be done more efficiently by a human. “These are objects that you will live in, be moved around by, that may live in you, that may live around you and not care about you at all … the way we choose to engage with those objects feels profoundly different to the way HCI has gotten us up until this moment in time,” Bell said. Bell’s speech in Dublin, titled “Managing the Machines”, included much more detail than reported here. Versions are being presented around the planet, and videos are starting to appear. This writer highly recommends them. 2018 was surely a transformative year for technological innovation. We saw early development of ambient computing, quantum teleportation, cloaks of invisibility, genomics advancements and even robocops. Granted we’re not flying around in our own cars like the Jetsons did yet, but we’re closer. In 2019 we will continue on the transformation path and expand even more into adopting cutting edge immersive technologies. What’s ahead for the coming year? I envision four emerging technology areas that will significantly impact our lives in 2019. The Internet of Things (IoT) refers to the general idea of devices and equipment that are readable, recognizable, locatable, addressable, and/or controllable via the internet. This includes everything from home appliances, wearable technology and cars. These days, if a device can be turned on, it most likely can be connected to the internet. Because of this, data can be shared quickly across a multitude of objects and devices increasing the rate of communications. Cisco, who terms the “Internet of Things,” “The Internet of Everything,” predicts that 50 billion devices (including our smartphones, appliances and office equipment) will be wirelessly connected via a network of sensors to the internet by 2020. The term “Smart City” connotes creating a public/private infrastructure to conduct activities that protect and secure citizens. The concept of Smart Cities integrates communications (5-G), transportation, energy, water resources, waste collections, smart-building technologies, and security technologies and services. They are the cities of the future. IoT is the cog of Smart Cities that integrates these resources, technologies, services and infrastructure. The research firm Frost & Sullivan estimates the combined global market potential of Smart City segments (transportation, healthcare, building, infrastructure, energy and governance) to be $1.5 Trillion ($20B by 2050 on sensors alone according to Navigant Technology). The combined growth of IoT and Smart Cities will be a force to reckon with in 2019! Emergent artificial intelligence (AI), machine learning, human-computer interface, and augmented reality technologies are no longer science fiction. Head-spinning technological advances allow us to gain greater data-driven insights than ever before. The ethical debate about AI is fervent over the threatening implications of future technologies that can think like a human (or better) and make their own decisions. The creation of a “Hal” type entity as depicted in Stanley Kubrick’s film, 2001 A Space Odyssey, is not far-fetched. To truly leverage our ability to use data driven insights we need to make sure our thinking about how to best use this data keeps pace with its availability. The vast majority of digital data is unstructured: a complex mesh of images, texts, videos and other data formats. Estimates suggest 80-90 percent of the world’s data is unstructured and growing at an increasingly rapid rate each day. To even begin to make sense of this much data, advanced technologies are required. Artificial intelligence is the means by which this data is processed today, and it’s already a part of your everyday life. In 2019, companies and governments will continue to develop technology that distributes artificial intelligence and machine learning software to millions of graphics and computer processors around the world. The question is how far away are we from a “Hal” with the ability for human analysis and techno emotions? The world of computing has witnessed seismic advancements since the invention of the electronic calculator in the 1960s. The past few years in information processing have been especially transformational. What were once thought of as science fiction fantasies are now technological realities. Classical computing has become more exponentially faster and more capable and our enabling devices smaller and more adaptable. We are starting to evolve beyond classical computing into a new data era called quantum computing. It is envisioned that quantum computing will accelerate us into the future by impacting the landscape of artificial intelligence and data analytics. The quantum computing power and speed will help us solve some of the biggest and most complex challenges we face as humans. Gartner describes quantum computing as: “[T]he use of atomic quantum states to effect computation. Data is held in qubits (quantum bits), which have the ability to hold all possible states simultaneously. Data held in qubits is affected by data held in other qubits, even when physically separated. This effect is known as entanglement.” In a simplified description, quantum computers use quantum bits or qubits instead of using binary traditional bits of ones and zeros for digital communications. Futurist Ray Kurzweil said that mankind will be able to “expand the scope of our intelligence a billion-fold” and that “the power of computing doubles, on average, every two years.” Recent breakthroughs in physics, nanotechnology and materials science have brought us into a computing reality that we could not have imagined a decade ago. As we get closer to a fully operational quantum computer, a new world of supercomputing beckons that will impact on almost every aspect of our lives. In 2019 we are inching closer. Many corporations, organizations and agencies have continued to be breached throughout 2018 despite cybersecurity investments on information assurance. The cyber threats grow more sophisticated and deadly with each passing year. The firm Gemalto estimated that data breaches compromised 4.5 billion records in first half of 2018. And a University of Maryland study found that hackers now attack computers every 39 seconds. In 2019 we will be facing a new and more sophisticated array of physical security and cybersecurity challenges (including automated hacker tools) that pose significant risk to people, places and commercial networks. The nefarious global threat actors are terrorists, criminals, hackers, organized crime, malicious individuals, and in some cases, adversarial nation states. The physical has merged with the digital in the cybersecurity ecosystem. The more digitally interconnected we become in our work and personal lives, the more vulnerable we will become. Now everyone and anything connected is a target. Cybersecurity is the digital glue that keeps IoT, Smart Cities, and our world of converged machines, sensors, applications and algorithms operational. Addressing the 2019 cyber-threat also requires incorporating a better and more calculated risk awareness and management security strategy by both the public and private sectors. A 2019 cybersecurity risk management strategy will need to be comprehensive, adaptive and elevated to the C-Suite. I have just touched on a few of the implications of four emerging technology areas that will have significant impact in our lives in 2019. These areas are just the tip of the iceberg as we really are in the midst of a paradigm shift in applied scientific knowledge. We have entered a new renaissance of accelerated technological development that is exponentially transforming our civilization. Yet with these benefits come risks. With such catalyzing innovation, we cannot afford to lose control. The real imperative for this new year is for planning and systematic integration. Hopefully that will provide us with a guiding technological framework that will keep us prosperous and safe. HUMAN beings becoming immortal is a step closer following the launch of a new start-up. Dr Ian Pearson has previously said people will have the ability to “not die” by 2050 – just over 30 years from now. Two of the methods he said humans might use were “body part renewal” and linking bodies with machines so that people are living their lives through an android. But after Dr Pearson’s predictions, immortality may now be a step nearer following the launch of a new start-up. Human is hoping to make the immortality dream a reality with an ambitious plan. Josh Bocanegra, the CEO of the company, said he is hoping to use Artificial Intelligence technology to create its own human being in the next three decades. He said: “We’re using artificial intelligence and nanotechnology to store data of conversational styles, behavioural patterns, thought processes and information about how your body functions from the inside-out. Live to 2050 and “Live Forever” Really? “This data will be coded into multiple sensor technologies, which will be built into an artificial body with the brain of a deceased human. Last year, UK-based stem cell bank StemProject said it could eventually potentially develop treatments that allow humans to live until 200. Mark Hall, from StemProtect, said at the time: “In just the same way as we might replace a joint such as a hip with a specially made synthetic device, we can now replace cells in the body with new cells which are healthy and younger versions of the ones they’re replacing. 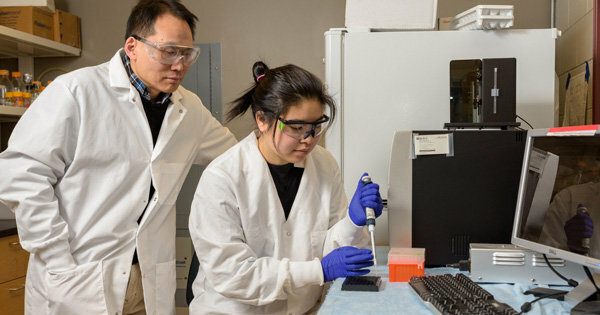 “Once we had designed the system, we had to first go into the lab and attach these DNA strands to various proteins we wanted to be able to control,” said study author Rebecca P. Chen, a doctoral student in chemical and biomolecular engineering (no relation to Wilfred Chen). The custom sequence designed DNA strands were ordered from a manufacturer while the proteins were made and purified in the lab. Next, the protein was attached to the DNA to make protein-DNA conjugates. The team also demonstrated that their DNA-logic devices could activate a non-toxic cancer prodrug, 5-fluorocytosine, into its toxic chemotherapeutic form, 5-fluorouracil. Cancer prodrugs are inactive until they are metabolized into their therapeutic form. To do this, the scientists based their sequence inputs on microRNA, small RNA molecules that regulate cellular gene expression. MicroRNA in cancer cells contains anomalies that would not be found in healthy cells. For example, certain microRNA are present in cancer cells but absent in healthy cells. The group calculated how nucleotides should be arranged to activate the cancer prodrug in the presence of cancer microRNA, but stay inactive and non-toxic in a non-cancerous environment where the microRNA are missing. When the cancer microRNAs were present and able to turn the DNA circuit on, cells were unable to grow. When the circuit was turned off, cells grew normally. Scientists from the University of Queensland have used photons (single particles of light) to simulate quantum particles travelling through time. The research is cutting edge and the results could be dramatic! Their research, entitled “Experimental simulation of closed timelike curves “, is published in the latest issue of NatureCommunications. The grandfather paradox states that if a time traveler were to go back in time, he could accidentally prevent his grandparents from meeting, and thus prevent his own birth. However, if he had never been born, he could never have traveled back in time, in the first place. The paradoxes are largely caused by Einstein’s theory of relativity, and the solution to it, the Gödel metric. Einstein’s theory of relativity is made up of two parts – general relativity and special relativity. 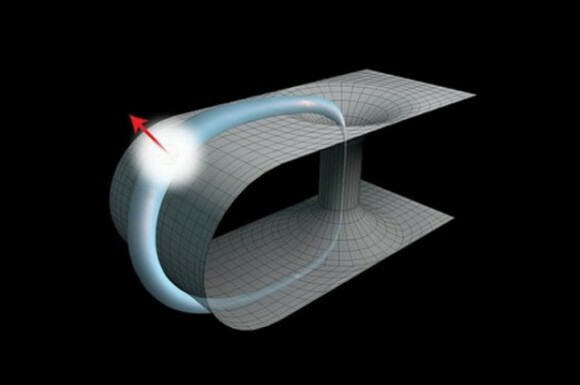 Special relativity posits that space and time are aspects of the same thing, known as the space-time continuum, and that time can slow down or speed up, depending on how fast you are moving, relative to something else. It was predicted in 1991 that quantum mechanics could avoid some of the paradoxes caused by Einstein’s theory of relativity, as quantum particles behave almost outside the realm of physics. The scientists simulated the behavior of two photons interacting with each other in two different cases. In the first case, one photon passed through a wormhole and then interacted with its older self. In the second case, when a photon travels through normal space-time and interacts with another photon trapped inside a closed timeline curve forever.